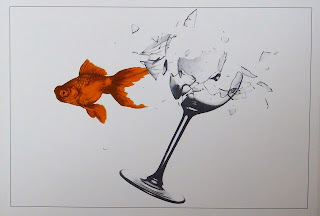 Griffin Moss, an artist living in London, receives an intriguing postcard from Sabine Strohem commenting on a concept for one of his cards (Drinking like a fish). It should not be in the least bit unusual for an artist to receive some reflection on his artwork. But, Griffin does not know who Sabine is. Moreover, Griffin has never shared his concept for the card with anyone. So, how does someone from a remote island in the Pacific know this? This is how one of the finest epistolary books begins. The book is a collection of postcards and letters sent by these two characters to each other. 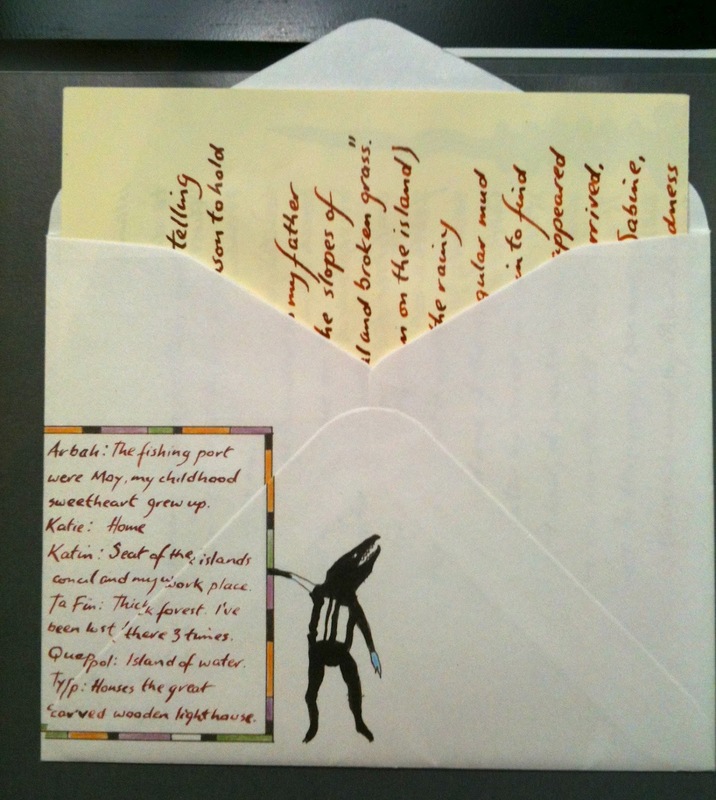 Each page shows the postcard artwork on one side and upon turning the page, one can read the message. In case of letters, one face of the page shows the front of an envelope and upon turning the page, one finds an envelope that can be opened to pull out a letter as shown below. There is a narrative element which is interesting on its own but the form takes it to another level. Without the accoutrement, this would make for a nice little short story. 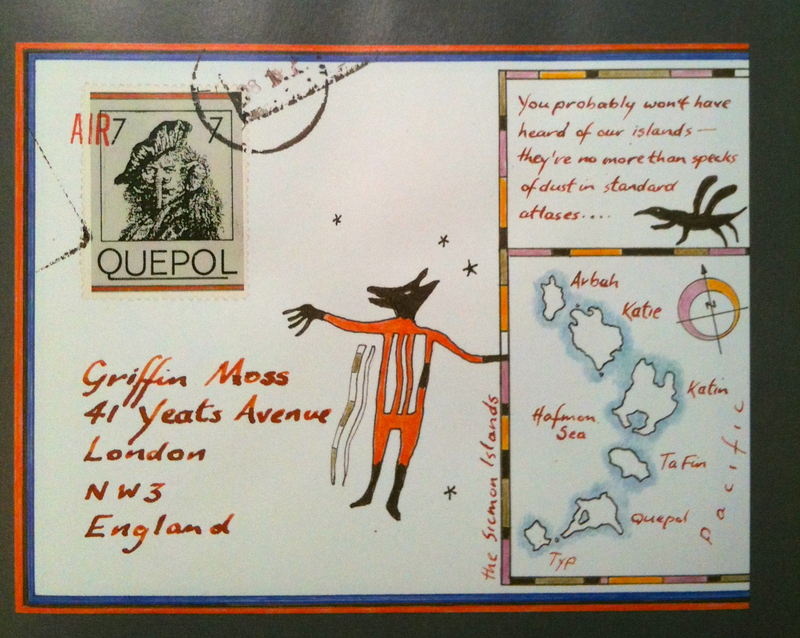 But by having the letters and postcards, it offers an almost voyeuristic pleasure. It also serves as means to making the story and the characters a little more intimate to the reader. There is a certain delight in going through the envelopes and pulling out the letters as you progress through the story. This is one aspect where the digital medium cannot compete and falls short. The artwork on each postcard and each letter is excellent. 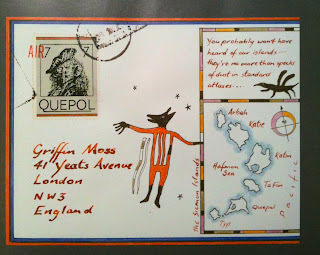 Since the communication takes place between someone living in London and the other person living on a fictitious island, it gives Bantock the liberty to create some new stamps. The artwork on the postcards is attributed to the two characters and largely, the artwork on each communication ties in to the message. This enhances the narrative flow and pulls the story together. A concept such as this was bound to be successful, and it was. This has led to two more books creating the Griffin and Sabine trilogy. The tenacity of the characters' draw on their fans was such that Bantock created a sequel trilogy a decade later where two other characters are introduced, Matthew and Isabelle. The content and the artwork in both trilogies is superb and lives up to the high expectations set by the first book. Griffin and Sabine is one of the reasons why one would keep and hang on to a book. While there are many merits to the digital medium in literature, there is simply no translation for the experience offered by a work like this. Yes, the paper will age and portions will fade over time. Perhaps the pages will start coming apart at the seams. But that will only add to the charm of this work, unlike the sterility of a digital reproduction. This is a prime example of why paper books will never go away. If you know someone who loves books or someone you want to fall in love with books (or just someone you love, period) then you have a perfect gift at hand. You can thank me later. Note: The postcards in the books are also available as a boxed set and are worth getting.